Halloween, a time of trick-or-treating, jack-o-lanterns, costumes and all things scary. The favorite time of year for most citizens of the Haunted Woods and many Neopians besides. With Halloween just around the corner, no doubt you've started customizing your Neopets appropriately in fancy new outfits and backgrounds, given them lots of sweet candies and prepared to take them to the Tooth Faerie afterwards. (The things sugar does to your teeth, oh dear me.) I imagine you've started buying gifts for your friends as well. But in all the chaos surrounding this great day, have you given any thought to yourself? To the avatar you will be displaying to all? To reflect your Halloween spirit? Have you? Huh? Well, maybe you have. But this article isn't for those well-prepared, organized Neopians who are already displaying their favorite spooky avatar all around the boards and receiving compliments left and right. No, this article is for those left behind, the ones so concerned for others they never gave a thought to themselves. And also the lazy ones who didn't feel like looking through their list of avvies to find a suitable one. Yes, I did all the work for you. Anyway, here it is, 13 great Halloween avatars, a colorful and spooky mix of wonderful pixels to adorn your posts all Halloween long! A fantastic stamp avatar like this will impress all year long but no more so during the spooky day itself. You'll be sure to attract attention and treats while sporting this rather creepy avvie. Rather than the bright oranges and greens so typical of Halloween themes, it is instead monochromatic and understated, filled with various shades of a dark, morose grey. Beautiful. Beware, though, as you may receive your share of tricks from those jealous of your elite avatar collecting skills. One of the newer avatars, and quite a popular one for good reason, the Mutant Graveyard of Doom II avatar has it all. Spooky Mutant Kacheek? Check. Jack-o-lantern? Check. Creepy nighttime fog? Also check. Not to mention the nifty animation as Albert the Kacheek appears... and disappears. It is filled with great colours to choose from so your signature is equally spiffy! Good luck getting this tricky game avatar; you'll need it! Who loves Halloween more than witches? No one. Except maybe trick-or-treaters. The point is, Halloween without witches is not Halloween! And if you're lucky to get this rare random avatar from our beloved witch, Edna, then surely it needs to be shown off! What's that? You don't love Edna and she refuses to give you her avatar? Oh. Well, sorry. Better luck next year. Pirate lovers unite! Halloween means dressing up in fun costumes and pirate costumes are as fun as it gets. Of course, cute little Usul pirates are not particularly scary so instead we have the creepy Captain Scarblade, complete with his awesome hat. This clickable avvie is easy to get and looks great! So get yours today! If you dare. Number five on our list is Evil Jhudora. Now, I'm sure some of you want to dress up as a faerie for Halloween. Which is fine. But why not dress up as the scariest, most evil faerie in all of Neopia? No one will dare to play a trick on someone with this avatar, because no one wants to mess with someone who's been doing favours for Jhudora! As an added plus, purple and green look amazing together! For you avid Trick-or-treaters, this avatar is absolutely perfect. Featuring colorful candy and the mischievous Pant Devil, sport this avvie to show people that your want treats but will play tricks on those who don't treat you well. After all, trick-or-treating is serious business. There's no joke when it comes to you and your candy. So people need to respect that. What's that you say? Pink isn't scary or spooky? It's just for little baby girls? Well excuse me but I beg to differ! Pink is quite scary. I'll have you know that Meepits are pink and what is more evil or more scary than a Meepit? Therefore pink is scary! Still not convinced? Well, I'm sure once you've tasted this seemingly innocent popcorn with a pink skull on the box you'll change your mind. 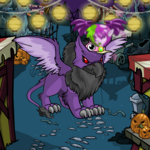 This pet avatar is great because it's spooky with a twist; pink for Halloween? Yes, please! Halloween Lupes, or Werelupes, are more than a little scary. And the one featured on this avatar looks downright deranged. Wouldn't want to meet this fellow alone in the Haunted Woods, now would you? This pet avatar will give you shivers and it has a nice dash of blood red to give it that certain 'don't come near me' quality we all love. Ah, Zomutts. Little zombie canines. Absolutely adorable... in a totally scary kind of way. Who can resist that little smile, those beady green eyes? The matted, grey fur and little horns. Irresistible, I tell you! But beware that this little guy could collect far more treats than you could ever dream! This easy clickable avatar is great for those of you with a softer side. Tired of the traditional pumpkin jack-o-lantern? So am I. Why not use an evil coconut to decorate your house this Halloween season? They're smaller than pumpkins, their eyes burn on their own and they're evil! Oh... wait. Maybe this isn't such a good idea... but the avatar is still awesome! This rare, much sought-after random avatar is sure to make you the envy of all your friends! Just don't turn your back on it. I can't deny it; my favorite Halloween pet is the Nightsteed. They're just simply awesome. The flames, the evil red eyes, the dark glare. A big win all around. It's a clickable avatar, but one of the scariest ones out there. You'll be sure to look your best sporting this creepy little avatar. Sloth is one of Neopia's most notorious villains and he's set on taking over Neopia. What better way to celebrate evil and darkness on Halloween than with this quite fashionable avatar? Support your favorite villain openly! A nice palette of colors to work with, plus Sloth's evil toothy grin equals one big win! If you're one of Sloth's biggest fans, he's sure to award you this shiny avvie. Remember before how I mentioned that Meepits are evil, hence pink is evil? Well, here we have last, but not least, the most evil, the most scary, the most MEEP avatar out there. If you're daring enough to earn this tricky game avatar (you'll need to please the Meepits to do so) and if you're brave enough to use it, you will help the Meepit cause and further their quest to rul--oh, I wasn't supposed to say that. The Meepits did not pay me to put their avatar in this article. And they are not coming to end the world. I need apples, pears, and an orange.